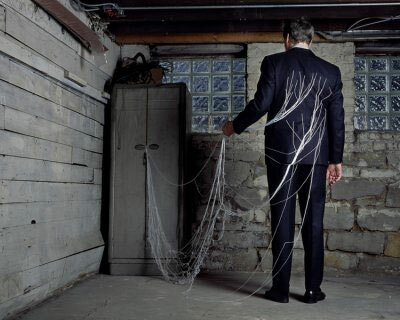 Image Credit: Untitled, from the series Basement Performances, 2005-2006 by © Lindsay Page. Basement Performances addresses the gap between how we perceive ourselves and how we imagine ourselves perceived by others. There is a desire to perform ourselves on our terms for an audience we control: an imagined audience. In these unseen spaces we are free to reinvent ourselves, reconnecting our inner and corporeal selves into a more desirable linkage. The performances address the private spaces hidden from those outside the boundary of ourselves and a desire to control the ways in which we are perceived. The setting of the basement is significant. It is a space of storage, of unseen corners and hidden objects. It is raw and unfinished and surrounded by shadows. To expose what occurs here is invasive and somewhat shameful and for this reason the medium of photography is an appropriate vehicle. This setting lends a tension to the performance, makes the viewer feel awkward and unwelcome as if they had glimpsed something they shouldn’t have. Lindsay Page is a Canadian interdisciplinary artist working primarily in photography and video installation. She received her BFA from Ryerson University, Toronto (2003) and an MFA from the School of the Art Institute of Chicago (2006). Her work has been exhibited internationally and has appeared in publications including Carte Blanche (2006) and Camera Austria (Spring 2007). She is the recipient of grants and awards including the Roloff Beny Foundation France Award, Society for Photographic Education Student Award and the School of the Art Institute of Chicago’s Trustee Merit Scholarship. She gratefully acknowledges the support of the Ontario Arts Council. Destinesia is a sound installation based on an examination of language and rituals as a means to define cultural identity. Using the “rules” of aural traditions in the process of recording and editing this piece, Destinesia look at the possibility of the “uninitiated” accessing a profound effect from a listening experience. This piece is part of a larger examination of the breaking down the structures of speech to look at the significance of its sonic elements for the listener.